I've already talked about the best episodes from season one and season two, now it's time to talk about season three. Though cut short by the writer's strike, season three was still able to produce quite a few quality episodes in its truncated sixteen (regular seasons are twenty-two). While you could argue that the strike made the season a little choppy, there are still a handful of episodes that really stood out as awesome. Here's where they get their due! Each title is a link to a youtube clip of a favorite scene of mine from each episode. There is so much I love about this episode. First of all, Jared gets to do more comedy, which he is actually quite good at, despite thinking otherwise. All of his bad luck, particularly the now infamous "I lost my shoe" scene provide so many giggles and chortles, what's not to love? We also met one of the recurring females of season three in this episode with Bela, and despite what may have come after, her introduction, you have to admit, was pretty awesome. She pulled a fast one on the Winchesters, and even shoot Sam in the shoulder! Anyway, this was one of the lighter episodes of season three, and one that I can watch many times over and never get tired of it. In this episode, ish really hits the fan. Not only do the boys get arrested by FBI Agent Victor Henricksen, but things quickly go from bad to worse when demons start showing up, wanting their pretty, pretty heads. Much like Nightshifter, of season two, this episode was very taught and action-packed. Also great was how Henricksen started out as a foe but ended up a friend through the course of events. Of course, like most friends of the Winchesters, that meant he was doomed to an untimely and violent death. At least he died at the hands of the newest big bad villain - Lilith. This episode featured her first appearance, and the first time we saw the white light hand of death. But my favorite scene, which may seem weird, was this little bit when Henricksen is taunting Dean. At first Sam is just sitting there behind Dean not really paying attention, but when Henricksen brings up their dad, he sits up and forward in reaction. I don't know why I love that little tiny thing, but I do. 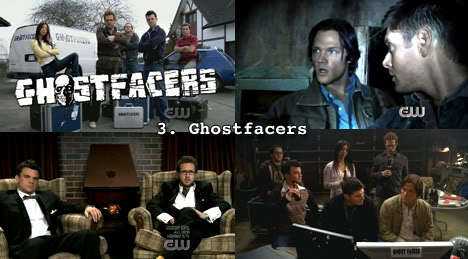 Ah, Ghostfacers. People either seem to love or hate this episode. Personally, I love it. I think it was a brilliant and innovative way to do an episode, and was hilarious to boot. It is basically a send up of all of the various ghost chasing shows that are on TV right now, featuring hand-held cameras shooting nearly the whole thing. What was also great about the episode was that they filmed it with language beeped out, so we got to see how much the Winchesters would really swear were they not on network television. And - Sam in a party hat. Hilarious. Um, sorry, there's something in my eye. No, it's NOT a tear! Ugh. Okay, okay, so maybe it is. This episode had a lot of tear-inducing moments. From seeing a very sad childhood Christmas, indeed, to seeing the adult boys celebrate their own very last (at the time) Christmas with each other, all with that Rosemary Clooney over the soundtrack. Well. You have to be a right old Grinch to not get a little bit of a thing in your eye. Aside from that, though, the episode had a fun mystery with a supposed Evil Santa, that actually turned into a couple of Pagan Gods who did some nasty pulling-of-fingernails and almost pulled out some teeth too. Yeegh! 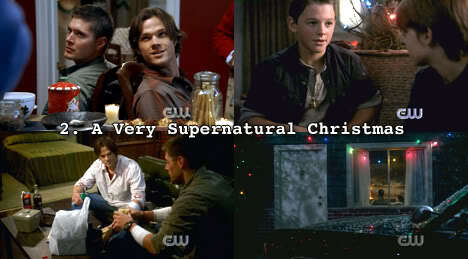 It's basically become a classic Christmas episode for me for that time of year. One of my favorite episodes of the series, ever. It is such a perfect blend of what I love about the show. You've got your humor, your angst, your brotherly love, your action. Really, what is not to love about this episode? From Heat of the Moment, to Dean's many deaths, to Sam's time spent alone, having to tend to his own wounds (yowza), and seeing the Trickster again? Well, seriously. I don't even know how many times I've watched this episode. The only thing that I wish would've happened was that Sam was more affected by the whole thing after the fact. He had to see Dean die so many times and then live without him for months before everything went back to "normal," but he doesn't necessarily act very differently in the episodes that follow, even though it seems like it would've made a big difference in him as a person. ANYWAY. Sorry, quibble quibble. And there you have it. Do you agree with my top five episodes, or do you think another episode should've bumped one of the ones I chose? 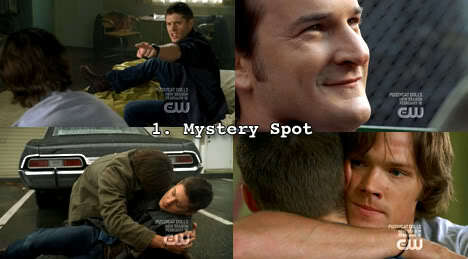 I definitely agree with Mystery Spot. I wasn't a huge fan of season three, so I can't say any of the others are on my favorite episodes list. However, they are certainly among the best of that season. Yeah, a lot of people weren't big fans of season three, but hey, it produced one of my favorite episodes of all time, so I can't fault it too much! I whole-heartedly agree with this list! Excellent episodes. Nice! This was probably one of the easier seasons for me to choose the top 5. I wonder what episode whoever clicked "other" in the poll likes best! I'd put "Magnificent Seven" and "Sin City" on the list for sure...and my god! "Dream a Little Dream of Me"
Interesting. I thought Sin City and Magnificent Seven were two of the worst of season three! Everyone has their own opinions, though! Nice list. Season 3 is among my least favorites but I think overall it was a good, solid season with great standalones like Jus in Bello, Bad Day at Black Rock etc.